Good times with some wicked awesome talent! 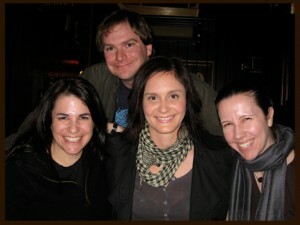 Last night I had a thoroughly enjoyable evening meeting with some very talented webseries creators. Organized by the Out With Dad team leader, Jason Leaver, this meet-up included Jason’s fellow producer Eric Taylor, Seeking Simone‘s lovely Renee Olbert, and Anyone But Me‘s wicked awesome Tina Cesa Ward. Lots of laughs and shared stories, but one of the best parts was actually getting to meet with these people – who I had only ever communicated with online – in person! Sometimes, making a webseries is a lonely man’s game. It was great to get together with other people on a similar journey. If you haven’t checked out some of these shows yet…do it! Do it now! Looks wicked! I will check it out!